There are many means of transport you could opt for: A tuk tuk, boat, bike, but the best way is by mini van. But if you’re hoping to share this incredible experience with a few like-minded travellers, a mini van is probably your best bet! Simply pop by a travel agent in town and they’ll book you onto a mini van tour with other visitors. The mini van is cheap and will collect you from whichever hostel/hotel you’re staying in. The journey will take around 45 minutes and you’ll get a couple of hours to explore the falls (falling head over heals in love with them in the process) before heading back to Luang Prabang. 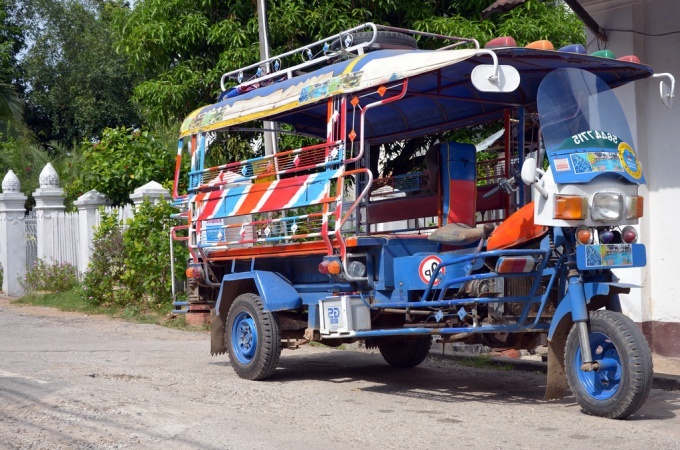 Tuk tuk’s are available to take you back to the town should you choose to stay a little longer. They are a cheap way to travel, but by god will you feel each and every bump along the way. It costs just under $3 to enter the falls and its well worth every penny…more in fact! We love a bargain. Be prepared for your jaw to drop to the floor like mine did on your first glance at the waterfall. It really does slap you around the chops with it’s stunning turquoise waters and lush green forest. Whatever you do, don’t forget you’re camera! 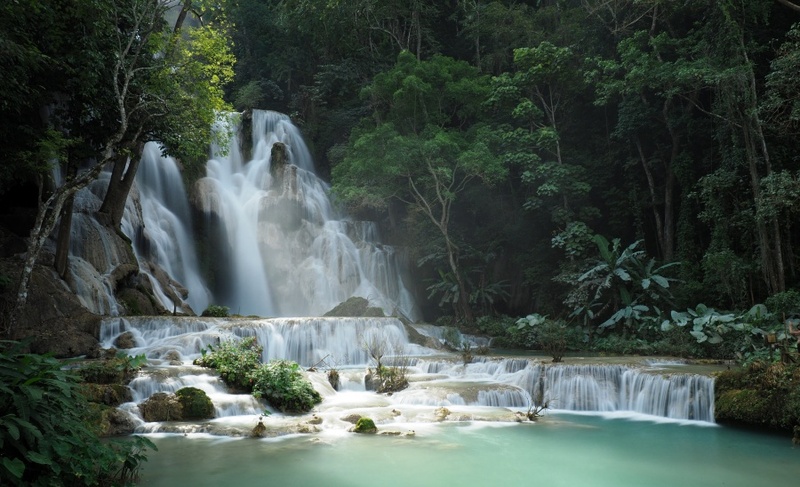 Kuang Si Falls is as beautiful to swim in as it is to photograph. The water is as blue as the sky and it cascades down an impressive 200 feet from what looks like endless sources in the mountains above before finally meeting to create an extremely impressive waterfall. It is without doubt, the most enticing pool of water I have ever seen. WARNING: Be wary that some pools are considered sacred so keep an eye out for the No Entry signs and obey them. You can’t visit Kuang Si Falls without making the climb to the top. It may be hard work, but it’s worth ever step. The journey to the top is an experience in itself. You’ll pass multiple pools of beautiful turquoise water, surrounded by rocks and overhanging trees. You’ll want to crack out a beer at every single one of them and sit on the edge soothing your feet in the perfect water. It takes a bit of stamina and attack to make it up the steep, muddy, clay slopes. You have to clamber up the slippery rocks at the side of the waterfall to reach the top. It had been raining the hour before we arrived, meaning the clay was soft beneath our feet. As you can imagine, this did little to ease the climb. When you’re having to repeat every step due to the clay falling away beneath your feet, you know you really want to see what’s waiting for you at the top. The groups of monks striding past us with ease definitely put us to shame. Absolute machines. Top Tip: Don’t climb the waterfall barefoot! Climbing barefoot was recommended to me by a local who I can only assume was a right prankster or whose english was not up to scratch…. Wear boots! Good ones! I must have left the pads of my feet at the top as by the time I climbed back down I was ball-less (so to speak). After clambering over rocks, trees and roots and making it up the side of the waterfall, we found ourselves standing almost knee deep in the pool at the very top. The view ahead of us was almost as breathtaking as the waterfall itself. You can’t quite see it in the photo below (my camera wasn’t the best!) but there was a golden temple catching the sunlight and glinting in the distance. Magic. We took a few cautious steps forward, moving as close as we dared to the edge of the pool. A quick look down revealed the 200 foot drop and gallons of water cascading down into the shining pools below. Gulp. Don’t attempt this if you’re unsteady on your feet! As we stood there in awe, amazed by this unique and beautiful place – we knew we’d stumbled across a little slice of true Asia. We knew that we’d remember and treasure this experience. 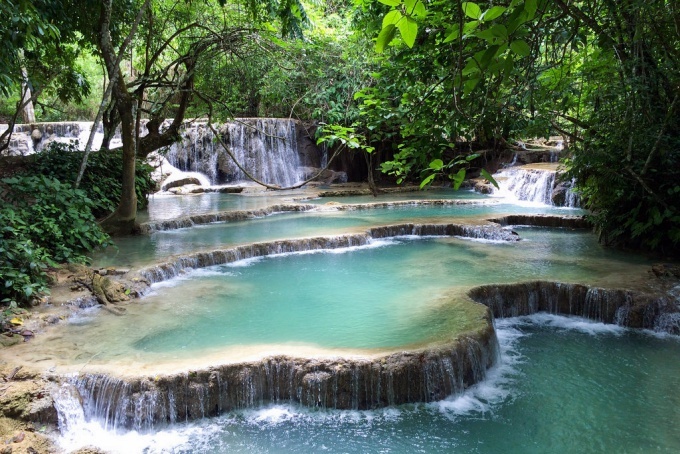 Be it photography, the want to climb a waterfall, the view at the top or just the idea of taking a dip in the beautiful blue waters, Kuang Si Falls will surely satisfy! 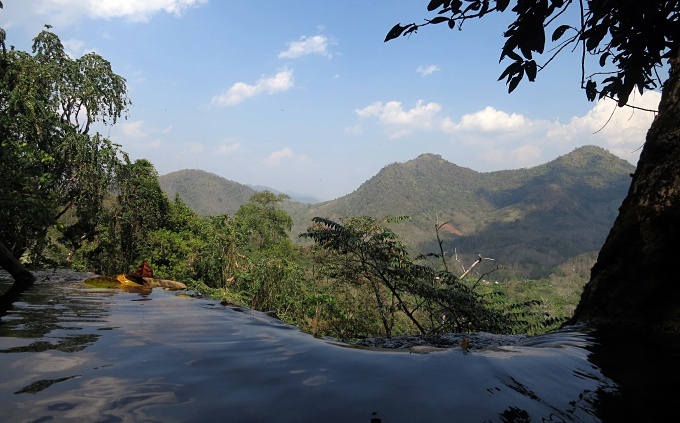 Its a great day out and a real highlight of Laos.